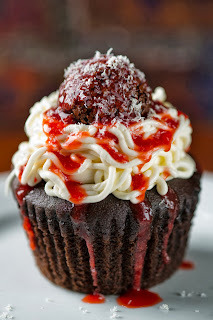 This is such an awesome cupcake, one of my favorites! The spaghetti and meatballs cupcake can be found in Hollywood Studio's at Mama Melrose's. It is one of the dessert options for the kids meals. The cupcake is chocolate with a chocolate meatball and strawberry icing for the 'sauce' and white chocolate for the 'cheese'. So creative and so delicious! Tip-If you are not ordering from the kids menu but wish to try the cupcake simply ask your server for it. The cupcake is sold ala cart for $3.49. 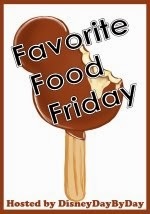 Welcome to Favorite Food Friday! We all are foodies, loving food is what we do. So now it's time to share, we want to hear about your favorite food of the week Disney or non-Disney related. Have a favorite recipe, share that too. How can I join the fun? First write up your post on your favorite food. Second copy our FFF button so people know you are in the FFF hop. Third, copy the linky to your page so everyone can link up. Lastly, add your link. It's easy and fun. Thanks for linking up! I am so looking forward to this for an April Fools Day snack for my kids! Perfect idea. BTW, I love Jen and Stitches N Bows, she's awesome, right? Saw your side bar. I really want to try this on my next trip! I wonder if I could just walk up to Mama Melrose's and order it from the hostess stand!? !